There is no official deadline to sign up for our courses, but classes do close due to size limitations. For classes starting in April, students who enroll in the course by mid-March should be able to reserve a space without a problem. If you know you are going to sign up for a class but you have not yet sent in your payment, you can always give us a call and we will place a courtesy hold on a space for you. The hold will ensure that a space in the class is still available for you when your payment arrives. Do I have to pay in full for my class when I enroll? Yes, payment must be made in full to be considered enrolled in the course. However, PowerScore does offer financing (payment plans) with Affirm* for our In Person and Live Online courses through our e-commerce check-out online. This payment option is available to our US customers, and will allow our customers to split the price of their purchase into fixed payment amounts that fit their monthly budget. Customers will have the option to pick from 3, 6, and 12 month plan to finance their purchase. If you are interested in financing your purchase with Affirm, just select Affirm at checkout where you will then be redirected to the Affirm website. For students outside the US, in certain situations we can arrange extended payment plans for those In Person or Live Online Course students who need more time to complete their payment. For more information, please call our offices at 800-545-1750. *Subject to credit check and approval. Down payment may be required. For purchases under $395, limited payment options are available. Estimated payment amount excludes taxes and shipping fees. Affirm loans are made by Cross River Bank, a New Jersey State Chartered Commercial Bank, Member FDIC. See https://www.affirm.com/faqs for details. The payment for our in person LSAT Accelerated Courses is refundable minus a $50 processing fee if you notify us in writing at least ten (10) business days prior to the start of your course, and you have not yet activated your Online Student Center account. The payment for our Live Online LSAT Accelerated Courses is refundable minus a $150 course deposit if you notify us in writing at least ten (10) business days prior to the start of your course, and you have not yet activated your Online Student Center account. The payment for our LSAT In Person and LSAT Live Online courses is refundable minus a $350 course deposit if you notify us in writing at least ten (10) business days prior to the start of your course, and you have not yet activated your Online Student Center account. The LSAT On Demand Course is completely non-refundable and non-returnable upon purchase. All payments made during the subscription period are nonrefundable. Yes. If you need to begin classes at one location and finish at another location, you can transfer between courses, as long as that course ends before the same LSAT administration as your current course. All that we require is adequate notice of your transfer so that we can make sure there is space for you in the new class and notify our instructors. Can potential students sit in on a class to see if the PowerScore teaching style works for them? First, we don’t expressly prohibit potential students from auditing our classes. We’re just far stricter about it than our competitors seem to be, and for good reason (in our opinion, at least). Our main priority is the student experience, so we take that into account before we ever start thinking “sales.” What that means is that we’re particularly wary of any potential disruptions or distractions in the classroom…basically anything that could detract from the central purpose of why we’re holding the class in the first place, which is to benefit those enrolled. When someone signs up with us their classroom time is for learning and growth, start to finish. They’re not a part of a PowerScore marketing opportunity or demo reel. In short, we run courses for the people in that course, not to boost enrollment in future courses. So as soon as you open the doors to non-students, you create an environment with a huge potential to negatively impact our customers: the enrolled students have all taken a practice test together and met the instructor at Test 1, whereas many sit-ins have not; the students all have course materials and have been prepped for the class experience via their Online Student Center, while the un-enrolled do/have not; auditing attendees often have questions (understandably) that require the instructor’s time and attention, resources we prefer to devote to our customers; other, logistical issues must also be taken into account like room size and instructor notifications and the like that distract from our principle devotion of assisting our students in need. So it is a risk that we’re cautious about taking: the opportunity for greater sales vs the possibility of undermining our student’s well-being is a situation where the latter concern ALWAYS wins out. That said, we also appreciate the value of “try before you buy,” so under the right circumstances we’ll allow prospective students to sit in on classes and get a feel for that experience. We approach it with care, but aren’t opposed in principle. Ideally though potential students can get a tremendous sense of our methodology and the classroom setting by other, more accessible means: we publish the most popular books on the market (the LSAT Bibles) at an extremely fair price allowing people to see the system our courses are built around with little barrier to entry, we make chapters of those books available online for free, and we even offer the majority of Lesson 1 from our Live Online Course as a free video to preview how the course functions: LSAT Course | Lesson 1 Preview (Pt.1). We also have an entire Free Help Area available on our site that includes tons of lessons and content, we operate daily on our Forum and our Blog so people get a clear sense of how we approach the test and our customer base in general, and anyone curious to learn more can call us up at 800–545–1750 and ask to speak with an instructor to get their questions answered and concerns addressed one on one. So there’s an unparalleled amount of access and transparency available, all while still ensuring that our students don’t in any way become victimized by self-serving attempts at selling future seats. How do your course books differ from the LSAT Bible publications? The PowerScore Course Books (used in our In Person, Live Online, and On Demand courses) are specially designed to accompany the lessons. The course books are exclusive materials provided only to students who enroll in our course and are not for sale separately. The Bibles are written as all-in-one self-study tools that contain strategies and application advice for every concept tested on the LSAT (collectively as a Trilogy for the whole test, or singularly by section). And they’re designed accordingly: they play the role of instructor, meaning the text is meant to guide readers from the fundamentals to the most advanced ideas, demonstrating step-by-step how and why everything works the way it does and how the right techniques can be best utilized to improve performance and maximize scores. So for students looking to study on their own, whether start to finish or as an entry point before moving into a classroom or tutoring sessions, those books are unparalleled. Our course materials are built around the same techniques and methodologies that have made the Bibles the most popular and successful books on the market, but adjusted somewhat to account for the fact that they’ll be accompanied by personal/live instruction. So there’s more room within the course books for the instructor to expand upon the information, supplement it with additional thoughts and examples and anecdotes, and constantly tailor it to the audience being taught. It’s a much more personalized and adaptive format, in other words. The course books also have many more drills and official PrepTest questions—in both the lessons and particularly the homework—to foster and reinforce perfect application of the approaches outlined. In short, the Bibles are an amazing tool for teaching yourself how to beat this test, whereas the course books are the ideal resource for an expert to teach you how to beat this test (and coupled with personal instruction provide a more powerful and individualized experience). That’s why we don’t use the Bibles in our courses, or sell the course books for self-study. Should I buy the available LSAC PrepTests to practice on before the class starts? No, unlike many other commercial test preparation courses, PowerScore is an official LSAC licensee and we provide each student in our In Person, Live Online, and On Demand course with a personal set of all licensable LSAC LSAT questions. If you are taking our Accelerated LSAT Course, additional LSATs can be purchased here. We do not recommend that you use alternate study aids to the PowerScore LSAT course. Our course provides complete and comprehensive preparation for the LSAT, and we provide you with a proven system to use in attacking the test. In our experience, the typical study book is too short to provide substantive help in preparing for the LSAT, and in many cases the effectiveness of the techniques in these study books is questionable. If you desire to begin studying PowerScore techniques before the class begins, consider purchasing our LSAT Logic Games Bible, LSAT Logical Reasoning Bible, or our Reading Comprehension Bible. The Bibles detail a number of the techniques we use to attack the Logic Games, Logical Reasoning, and Reading Comprehension sections of the LSAT. The book uses simulated LSAT questions. Real questions are available from LSAC (producers of the test) for a fee. A book uses real LSAT questions only if the following notice appears in the copyrights: "All actual LSAT questions printed within this work are used with the permission of Law School Admission Council, Inc., Box 2000, Newtown, PA 18940, the copyright owner. LSAC does not review or endorse specific test preparation materials or services, and inclusion of licensed LSAT questions within this work does not imply the review or endorsement of LSAC. LSAT is a registered trademark of LSAC." Authors who fail to use real LSAT questions are cutting corners. What does that say about their integrity and trustworthiness? The author talks more about "general test strategies" than the questions on the test. While strategy is certainly an essential part of taking the LSAT, a thorough knowledge of the different types of questions and logical concepts that appear on the LSAT will do more to alter your score than most "strategies." The author spends a great deal of time on the Writing Sample. The Writing Sample is unscored and is not a significant factor in law school admissions. Only a brief discussion is appropriate. The book doesn't contain a discussion of sufficient and necessary conditions, also known as conditional reasoning. Conditional reasoning appears on both the Logical Reasoning section and the Logic Games section. The book doesn't contain an extensive discussion of cause and effect reasoning, also known as causal reasoning. The author recommends using Venn Diagrams (overlapping circles) for solving certain problems. Venn is simply too time consuming and contains inherent assumptions that can lead you to miss problems. The book uses a numerical system for classifying Logical Reasoning question types. Numerical classification systems force you to add two unnecessary levels of abstraction to your thinking process. For example, consider a question that asks you to "weaken" the argument. In a numerical question classification system, you must first recognize that the question asks you to weaken the argument, then you must classify that question into a numerical category (say, Type 10), and then you must translate Type 10 to mean "Weaken." Literally, numerical classification systems force you to perform an abstract, circular translation of the meaning of the question, and the translation process is both time-consuming and valueless. There are less than 300 pages that cover the Logical Reasoning section (not including practice tests). The book discusses Family Tree games (these haven't appeared on the LSAT in over 10 years). The author recommends using a matrix of any sort. The matrix can be recognized because the author will recommend using checks, X's, and O's to fill in the grid. These games can be solved by more efficient methods. There are less than 200 pages that cover the Logic Games section (not including practice tests). Recommends reading each question before reading the passage. This laughable strategy wastes entirely too much time. Recommends reading only the first and last sentence of each paragraph. If the book you are using contains any of the above features, you are using a book that is not on the cutting edge of LSAT knowledge. Give us a call soon! 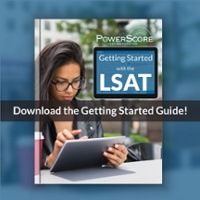 Do I receive Online Material as part of the PowerScore LSAT course? Yes. All students in a PowerScore LSAT Course have access to our Online Student Center, where practice tests can be scored and exclusive course supplements can be accessed. How long do I have access to the Online Student Center associated with my course? For the On Demand course you will have access while the subscription is valid. For all other courses you will have access for an additional 90 days once your course is over. After that point, you can call PowerScore at (800) 545-1750 to pay a fee to receive additional access for one more testing period. When our course was originally designed, we listed the essential concepts that needed to be taught in order to provide the best possible LSAT preparation. Then we constructed a course schedule that allowed us to cover each of these concepts thoroughly. For example, most companies spend approximately 7-10 hours covering the Analytical Reasoning section of the LSAT. At PowerScore we spend over 20 hours on the Analytical Reasoning section. Think of it this way: the LSAT is one of the most important tests you will ever take in your life. How well you score on the LSAT will strongly impact your choice of law schools, and ultimately your future earning power. Do you really want to take a class where they have to rush through the topics and maybe leave out key concepts? Why does PowerScore require all of their instructors to score 170 or higher on an actual administered LSAT? Why should we, or you, settle for less? The LSAT is one of the most intellectually demanding standardized tests ever developed. Our instructors, all of whom have scored 170 or higher, have proven that they fully understand the test themselves, and thus are able to focus more on teaching and answering questions since they don't have to struggle to understand the concepts that appear on the LSAT. Instructor candidates with lower scores usually received those scores because they couldn't fully grasp and apply all of the techniques that effectively attack the LSAT. If they couldn't properly use and apply the ideas themselves, it's generally going to be more difficult for them to pass along those same ideas to their students. Also, many of our students want to score in the 160s and 170s on the LSAT. If their instructor has only been able to manage a 160 or 165 on the test, how much confidence do you think that instructor would inspire in his or her students? When a student comes to one of our instructors and says, "I want to score in the 170s," our instructors can say, "All right, here's what it takes, and here's how I did it." Our competitors with lower instructor standards often claim that teachers with high scores don't necessarily make the best instructors. We couldn't agree more, and that's why we don't hire many of the qualified applicants we interview. When selecting instructors, we look for people who can patiently and effectively explain the ideas of our course, people who can interact well with others in a classroom setting, and those who truly enjoy teaching. Finding instructors like this isn't easy, and that's why we offer one of the highest starting salaries in the industry. In addition, we put our instructors through a rigorous training program before they ever set foot in a real class. At PowerScore we demand the best and we expect our students to do the same. If classes are available, you can repeat our In Person or Live Online Course for the returning student rate of $575 per repeat, which is used to cover the LSAC Question Licensing Fee and the cost of material reproduction. This rate is available for up to 2 repeat courses within 2 years of your original course, and includes a fresh copy of the course materials. Please note that our repeat policy differs from others in that we allow you to repeat our full course, not a shorter refresher course. Also, unlike other courses, we do not require that you attend every class in order to be eligible to repeat the course at the reduced rate. If you attended the Live Online LSAT Accelerated Course you may repeat the course up to 2 times within 2 years of your original course date for a fee of $200 per repeat. This includes a fresh copy of the course materials. For the in person Accelerated LSAT Course re-enrollment is free if you re-use your original course material or $200 if you require new material. This policy is valid for 1 repeat within 1 year of your original course date. How does the On Demand Course enrollment and subscription process work? An initial $350 enrollment fee is required for the first 30 days of access, then $175 every thirty days thereafter. Students may cancel their subscription at any time by calling us at 1-800-545-1750 Monday through Friday 8am to 8pm EST, Saturday 8am to 3pm EST, or by emailing us at contact@powerscore.com. No. Unlike some other courses, there is no additional materials fee for any of our courses. The course tuition that you pay includes all materials, and of course the materials are yours to keep once the course has ended. We offer ongoing discounts on our LSAT courses for members of the Military or members of the Pre-Law Society. If you qualify for either discount, please email contact@powerscore.com with your proof of membership, and call us at 800-545-1750 to complete your enrollment. For students looking for expert, comprehensive assistance as they apply to law school, we offer our comprehensive Law School admissions consulting programs. Our law school consultants provide help for our students in all areas of the applications process, and continually counsel students on such issues as writing the application essays, getting recommendations, and deciding which law schools to apply to and attend. We extend these services to all of our students both past and present and, in fact, most students take advantage of our help after their LSAT course ends. In addition, if you are a current or former PowerScore student, you will get 10% off admissions consulting services.